Hyundai is wearing a robot and stepping outside of a street. This robot is a wearable walking assistant that can be used for variety of customers such as senior citizens, disabled, and others. Hyundai is planning to expand its territory of its future service by not only developing this robot so that it drives a car, but being able to be humans’ all moving cycle from the moment it walks towards a car to ride in it and until it gets off after. Although it is not ready to be mass-produced, Hyundai’s intention is to become ‘Total Mobility Developer’, which focused on all means of transportation, rather than being just a manufacturer of finished cars. 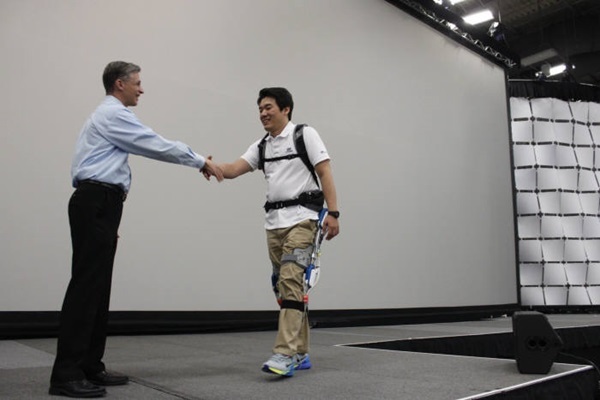 At National Instrument Week (NI Week) 2015 that was held in Austin, Texas on the 6th (U.S. time), Hyundai introduced to public for the first time an exoskeleton-type wearable robot H-LEX (Hyundai LifecaringExo Skeleton) that was developed by Hyundai’s Central Laboratory’s Human Convenience Research Team. As it was awarded for high-tech manufacturing and control areas during ‘Engineering Impact Award’ that was held during this event, it received many engineers and developers’ attentions that gathered from all over the world. 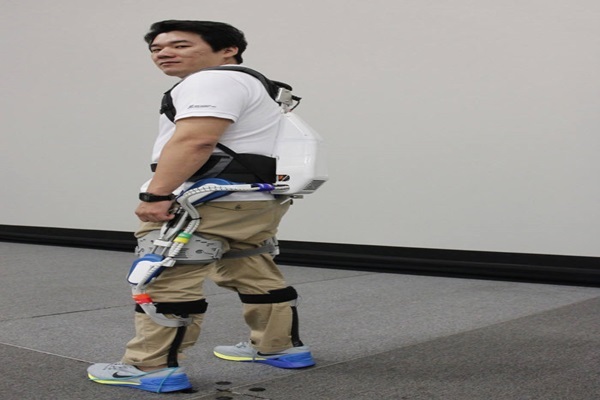 Unlike wearable robots that were developed mainly for military purposes or rehabilitation and walking of patients who are paralyzed from lower half of the body, H-LEX is being developed so that it can be used for variety of customers including senior citizens and disabled. It is sort of means of transportation just like cars. One can set up variety of functions such as amplified mode that provides much strength to legs, injury protection mode that prevents from falling, walking mode that helps people who have trouble walking, and others. One can change modes or control speed by connecting it to mobile equipment such as Smartphones, tablet PCs, and etc. and check personal health information such as walking posture or a part that is being applied by pressure. Head Researcher Hyun Dong Jin and others demonstrated how the robot works by actually wearing H-LEX during this event. Although walking looked a bit awkward, it did not look inconvenient. 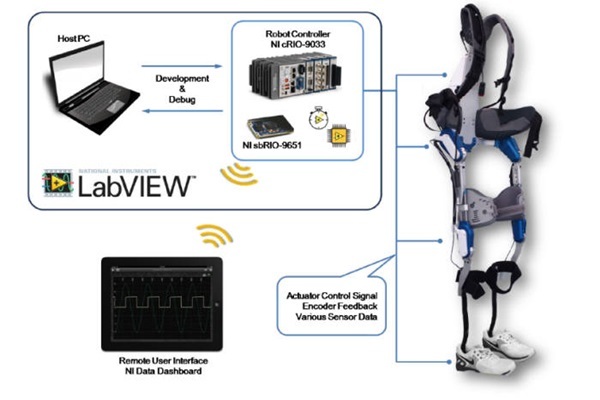 It showed smooth movement as sensors, actuators, and motors that are located on exoskeleton and joints control posture in real time. H-LEX showed real time-like drive reaction and delicate movement control as NI measurement control solution Compact RIO and System On Modules are installed in back part. Hyundai also increased safety by installing safety equipment so that joints cannot be turned where human skeleton is not made to be turned. One can divide modules from support of all of lower body into either support of hip joint or support of knees depending on needs. It weighs about 11 to 12 kg, and a cover that covers top of exoskeleton is painted in blue, which is Hyundai’s CI color, to give a point. Although Hyundai does not have any detailed plan to mass-produce H-LEX, it is planning to continue with R&D to secure reliability and ability to mass-produce so that it can rapidly react once market opens up hereafter. Not just robots but Hyundai is also working on development of variety of personal means of transportation. Because one of small problems of wearable robots just like cars is linked to safety, Hyundai needs to maintain outside circumstances such as international safety standards, systems, and regulations regarding robots. It is planning to solve standards and certification problems by continually discussing with National Rehabilitation Center, Rehabilitation Engineering Laboratory, organizations for disabled, and etc. “We are not focusing on this R&D with a mindset that Hyundai will start earning profits through this technology as robot technology is a very difficult technology. Based on company’s product identity (PI) ‘CARING’, we are going to prepare for future market at the same time as we contribute to society with our technology levels.” said Head Researcher Hyun Dong Jin.